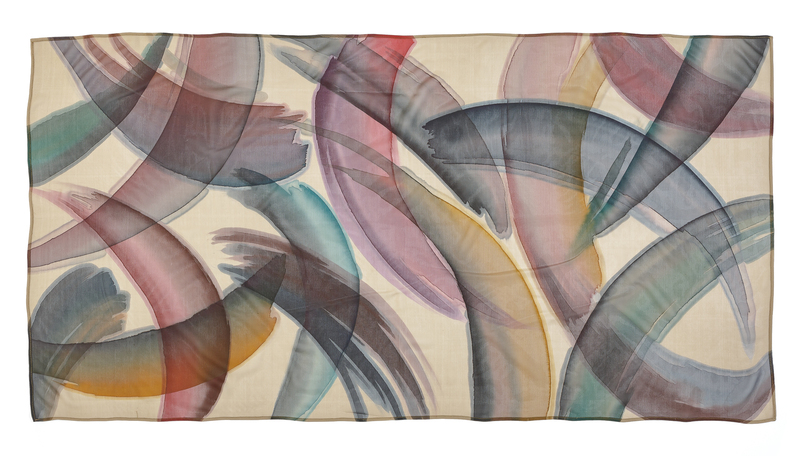 This refined pure silk scarf painted with vibrant brushstrokes in the nuanced and watercolored tones of dark brown and wood green has a free decorative composition. 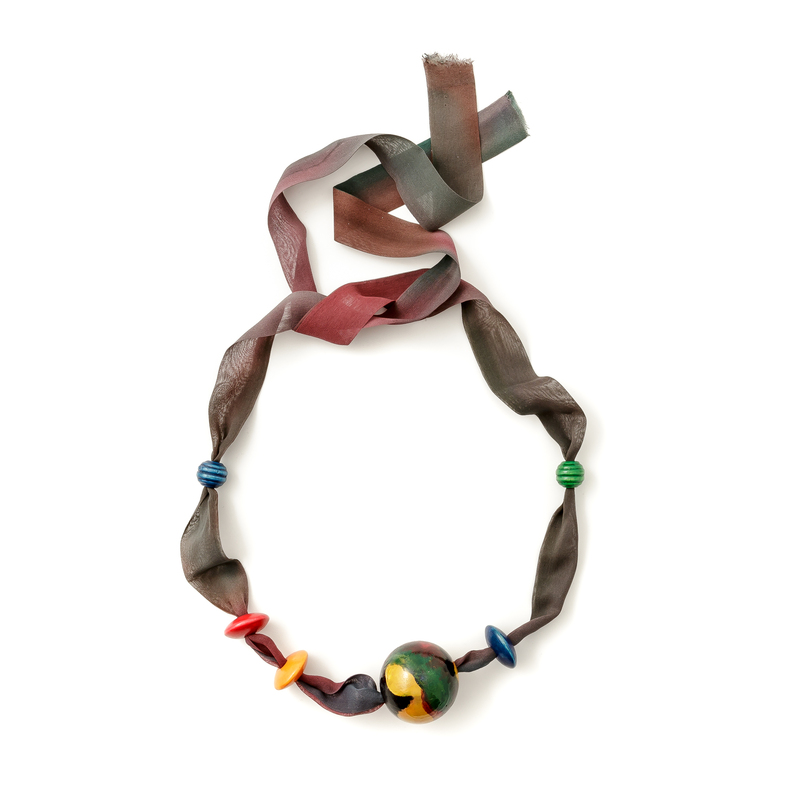 This prized necklace realised with wooden beads of different shapes and sizes, hand-painted in bright polychromy is strung so as to realise a free asymmetrical composition on a silk voile ribbon painted with fine watercolours in tonal variations. 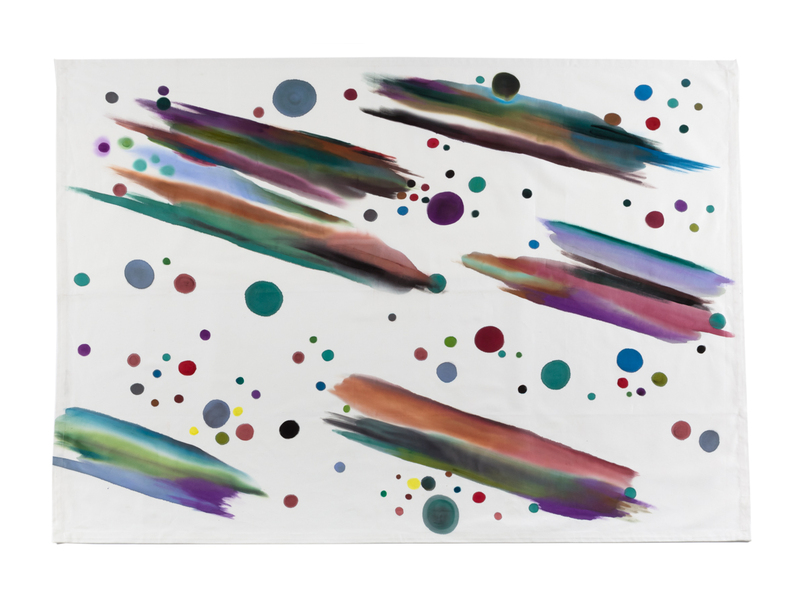 This table set includes a hand-dyed cotton tablecloth and napkins, featuring thick brush strokes and many-coloured bubbles on a white field. This peculiar hand-painted artefact is a unique and exclusive piece. 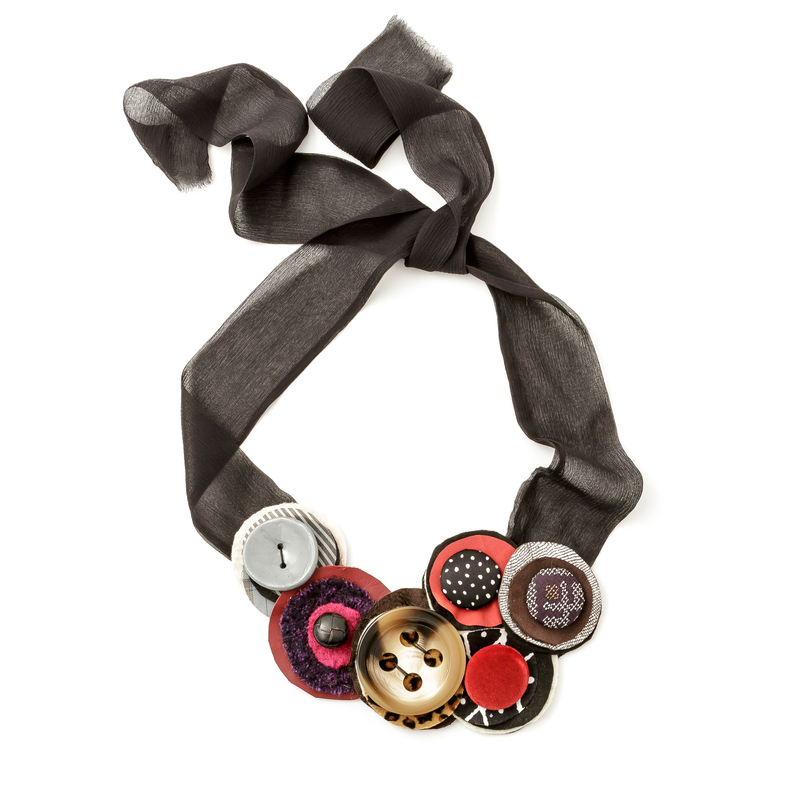 Elegant yet playful, this necklace made up of brightly coloured polychrome circles of fabric and buttons of different shapes and sizes is done up by means of long black silk voile ribbons. 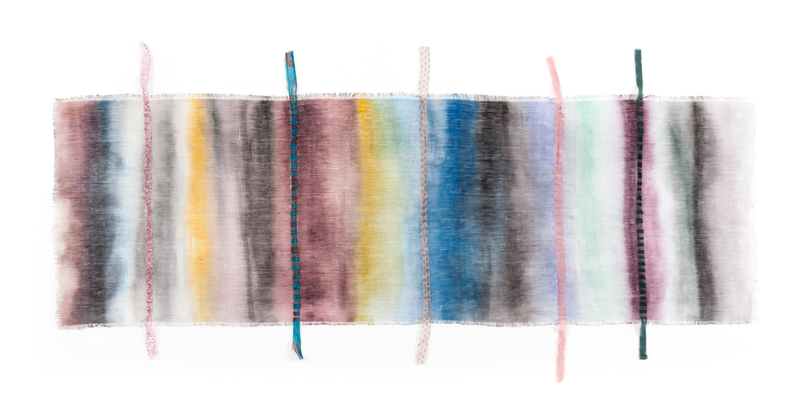 This fine linen table runner is hand-painted with watercolour shades, featuring drawn threads and several silk strips. The choice of colours is inspired by traditional Sardinian combinations. The collaboration of the two artists and craftswomen, Maria Cristina Boy and Margherita Usai, started about twenty years ago and led to the opening of TRAmaRE, a space dedicated to the inspiration and creation of artistic productions, where every detail is cared for. Artefacts feature plays of colour, through the fusion of different materials, a fabric painting technique that provides a unique touch. At the TRAmaRE workshop, brushes paint on silk, jute and tarlatana, give light to linen, wool and orbace. Natural elements are used to craft home decorations and innovative fashion accessories. During the last few years, the experience gained while collaborating with Edilana and Daniela Ducato, give an added value to the TRAmaRE project. TRAmaRE's production is rich and varied, ranging between collections of furniture pieces to home accessories: curtains, cushions and throws, duvet covers, bedspreads and sheets, tablecloths and runners. But also, scarves, hair ornaments, necklaces and brooches. Aesthetics and subjective perception interpret every creation crafted in the workshop. Combinations of natural fibers, color shades and inventive elements. All TRAmaRE works are hand-painted and may be washed or dry cleaned. All materials, which are strictly natural, are shaped and adapted to different crafting projects. Linen, jute, tarlatan, wool are 100% Sardinian. Their jewels are often created with recycled materials, except painted silk scarves: pottery or vintage products, purchased by the artists while strolling around markets and shops.